It's May! 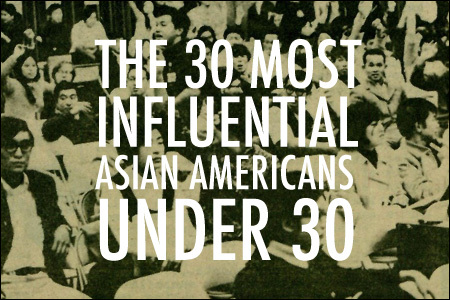 In honor of APA Heritage Month, I've put together a list of people I'm calling the 30 Most Influential Asian Americans Under 30. Each day this month, I'll reveal one person from the list -- a young person (30 years old or younger) who is making a difference in his or her community, profession and the world at large. Last month, I put a call out asking you to nominate folks they thought should be on the list. Thank you to everyone who suggested so many worthy individuals. Unfortunately, only thirty can make the list. And that's the thing. Not long after setting out to put this list together, I realized what a difficult task I had taken on. How exactly do you determine who is actually influential? Is there a measure of quantifiable influence? Let's make it clear -- this list is highly subjective. It's a mix of folks who are making waves in their respective areas of influence, up-and-coming young leaders and personalities, as well as people I just like and admire. And there you have it. Hope you liked the list. Sorry if your favorite person under 30 didn't make it. But hey, maybe we'll do it again next year.